and with financial support of Ministry of Culture and under the patronage of the Honorary Consul of Bulgaria in Piedmont and Valle D Aosta Gianni Stornello. „Unicredit Bulbank“ provided prize money amounting to € 3,300. 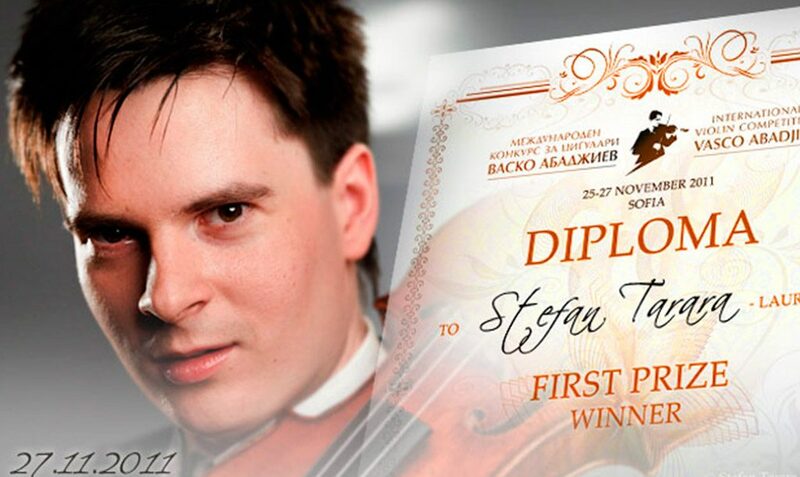 „Stefan could easily compete with the legendary Vasco Abadjiev, and even surpasses him in skills,“ praised the winner Prof. Nedyalcho Todorov, one of the members of the international jury. Tarara, which performed its first gig only 4 years old, received the first prize of 1,500 euros and a statuette made by artist Peter Savov. Stefan has an interesting “Bulgarian connection” – his girlfriend is our pianist Lora Vakova who made the accompaniment over the competition. Currently Stefan, who plays the violin Jean Baptiste Viyom (Paris, 1860) is in the class of Prof. Zahar Nuhimovich Bron in Zurich Academy. Second prize was awarded to 21-year Korean Danbi Um, a student at Tel Aviv University. She started with her first violin when she was 2,5 years only and by her 10th was admitted to the Institute of Music „Curtis“ in Philadelphia. The jury decided the third place to qualify four – 15-year-old hope of Spain Elina Pencheva Rubio, whose mother is Bulgarian, Manciu Ionel (Moldova), Balint Kruppa (Hungary) and Zornitsa Ilarionova (Bulgaria). President of the Jury Professor Angel Stankov and the President of UNESCO Club „Leonardo da Vinci“ Janet Borlakova announced that following the successful first edition has already started preparations for the second edition planned in 2 years. The aim of the initiative is the revival of national and international memory of the great violinist Vasco Abadjiev (1926-1978) and it is in connection with officially supported by the Ministry of Culture idea of Club UNESCO „Leonardo da Vinci“ year 2011 to be declared the Year of Vasco Abadjiev on the occasion of 85years of his birth.